The Hartsoe Law Firm is dedicated to providing high-quality legal representation to individuals in Knoxville and elsewhere in Tennessee who have been injured due to the negligence of others. Mark Hartsoe has decades of experience handling a broad range of legal claims, including car accidents, truck accidents, motorcycle accidents and slip and fall. If you have been injured as a result of the negligent conduct of another person, Mr. Hartsoe has the skills and experience to help you seek the compensation to which you are entitled by law. Tennessee law holds drivers accountable for their actions. In Tennessee, as elsewhere, drivers are required by law to exercise reasonable care when operating their vehicles. This duty extends not only to other drivers on the road, but also to bicyclists, motorcyclists, and pedestrians. A driver who is careless-perhaps due to operating a GPS device, adjusting the radio, texting, or under the influence of drugs or alcohol-is liable for any foreseeable injuries his carelessness causes to others. To establish liability in a car accident case, a plaintiff must prove (1) the defendant breached a duty of reasonable care owed to the plaintiff, (2) and that the defendant's breach of duty was the legal cause of the plaintiff's injuries. An experienced personal injury lawyer can help Knoxville residents prove each element of their claim to a judge or jury. Mr. Hartsoe has been repeatedly selected as a Mid-South Super Lawyer since 2006, which puts him in the top 5% of attorneys in Tennessee, Arkansas and Mississippi, as evaluated by Law and Politics Magazine. If you succeed in your personal injury lawsuit, you may be entitled to recover for past and future medical bills, lost wages, physical pain and suffering, mental pain and suffering, loss of enjoyment of life, and permanent or disfiguring injuries. In rare circumstances, where the defendant's conduct constitutes recklessness or gross negligence, you may be entitled to punitive damages. Punitive damages are intended to punish the wrongdoer (rather than compensate the injured party) and are available only when the defendant acted in a particularly egregious manner. Skilled car accident attorney Mark Hartsoe can help you understand what damages are available to you based on the specific facts of your case, and he can build a strong case on your behalf. If your close family member died in an auto accident due to someone else's fault, you may be able to file a wrongful death lawsuit. Tennessee law permits the spouse or children of a deceased person-or if there are none, then the person's estate-to file a wrongful death lawsuit to seek damages from the person or persons who caused the death. Under Tennessee Code Annotated § 20-5-113, damages recoverable in a wrongful death suit may include mental and physical suffering, loss of time, and necessary expenses resulting to the deceased from the personal injuries, as well as assorted other damages. A knowledgeable Knoxville personal injury lawyer can help you maximize your recovery to cover the costs associated with the accident. Truck accidents present many similar issues to auto accidents but are often significantly more complex. Commercial trucks are often transporting goods for one company, driven by independent contractors, and may involve several other parties as well. Some or all of these parties may be liable for causing, or contributing to, the truck accident. Further, truckers may be subject to both federal and state regulations, and an experienced truck accident lawyer can help you identify all responsible parties and hold them accountable for your injuries. There are strict laws governing how many hours a truck driver may work, and truck driver fatigue is one common cause of truck accidents in Tennessee. Other reasons for a truck accident include improper balancing or loading, faulty brakes, distracted driving, and excessively wide turns. On the opposite end of the vehicle size spectrum are motorcycles. These small but powerful vehicles are uniquely vulnerable on Tennessee roads and highways. Motorcycles tend to be less visible to other vehicles, and motorcycle accidents often involve catastrophic or fatal injuries. Despite their small size, motorcycles are subject to the same rights and responsibilities as other drivers on the road, and the failure of a driver to exercise reasonable care toward motorcyclists can impose liability for any resulting injuries. A personal injury attorney in Knoxville can help you bring a claim to hold a driver accountable. Unfortunately, injuries happen all too often when a property owner fails to adequately maintain its premises. Businesses and individuals are expected to use reasonable care to protect people who are lawfully on their property from preventable accidents. A common example is a slip and fall in a store or restaurant, caused by food or liquids that have been spilled on the floor. Other situations that may result in serious injuries include poor lighting or inadequate security, improperly stacked merchandise, broken stairs or handrails, and uneven pavement on sidewalks. A victim of an accident on someone else’s property must establish that the property owner or occupier failed to use the appropriate level of care in the circumstances and that they were hurt as a result. One key element in premises liability cases is the legal status of the victim as a visitor to the premises. Business invitees, such as customers at a store, patrons at a restaurant, or guests at a hotel, are owed the highest degree of care. A business must regularly inspect its property for any dangerous conditions and either repair them or warn invitees about them. It may be held liable not only for hazards of which it actually knows but also for those of which it reasonably should have been aware in the situation. Social guests, also known as licensees, are owed a slightly different duty of care. Property owners are required to refrain from intentionally harming their guests, and they also must fix dangerous conditions of which they are aware or make sure to let their guests know about them. They may not be held accountable for hazards of which they do not actually know, since their duty to regularly inspect their property is less demanding than the duty of a business. A Knoxville personal injury attorney can advise you on whether you may have a claim under the circumstances of your accident. While adult trespassers are owed only a minimal duty of care, which requires the property owner to refrain from intentionally harming them, child trespassers may be entitled to significantly greater precautions from a property owner. This is because children may be inclined to wander onto a property because of a certain attraction there, such as a swimming pool or a play set. Devastating injuries may result from slip and falls or other premises liability accidents. Victims may be able to seek a broad range of damages, such as compensation for economic costs and losses like hospital bills, the costs of future medical treatment, and lost income. They usually also can pursue compensation for non-economic types of harm, like the pain and suffering that they endured. In some of the most tragic cases, the carelessness of a property owner leads to a fatal accident. Family members who lose a loved one in these circumstances have the right to bring a wrongful death action, pursuing compensation for their loss. As with other slip and fall claims, this process can be complex. You should seek representation from slip and fall attorney Mark C. Hartsoe if you have been hurt or have lost a loved one in an accident on someone else’s property. 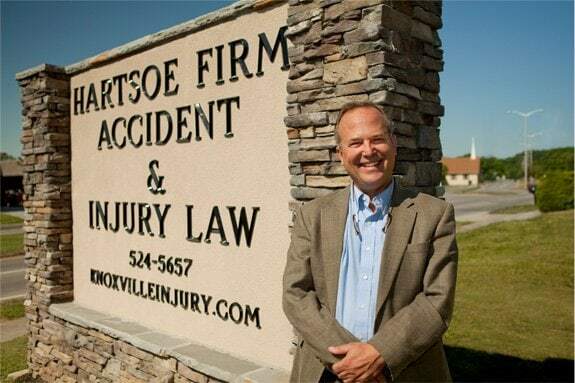 Mr. Hartsoe is committed to helping victims of auto accidents and other types of accidents in Knoxville, Maryville, and elsewhere in Tennessee. He has been recognized by numerous organizations for his excellence in legal practice. For example, he was certified as a member of the Million Dollar Advocates Forum for his multiple cases that resulted in verdicts or settlements in excess of One Million Dollars ($1,000,000.00). This places him among the top 1% of U.S. lawyers, and the Forum is recognized as the most prestigious group of trial lawyers in the United States. He is a member of numerous local and state associations and organizations, and he is actively involved in various aspects of the Knoxville and Maryville communities. For an experienced and skilled personal injury lawyer in Knoxville, contact Hartsoe Law Firm. Mark Hartsoe will see that your case receives the attention and resources it deserves, and he will work tirelessly to see that you get the maximum compensation to which are entitled by law. Call now at 865-524-5657, or contact us online to schedule your free consultation.